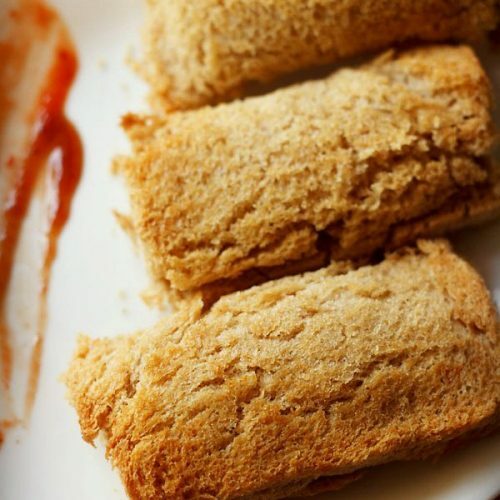 paneer bread roll recipe with step by step photos. 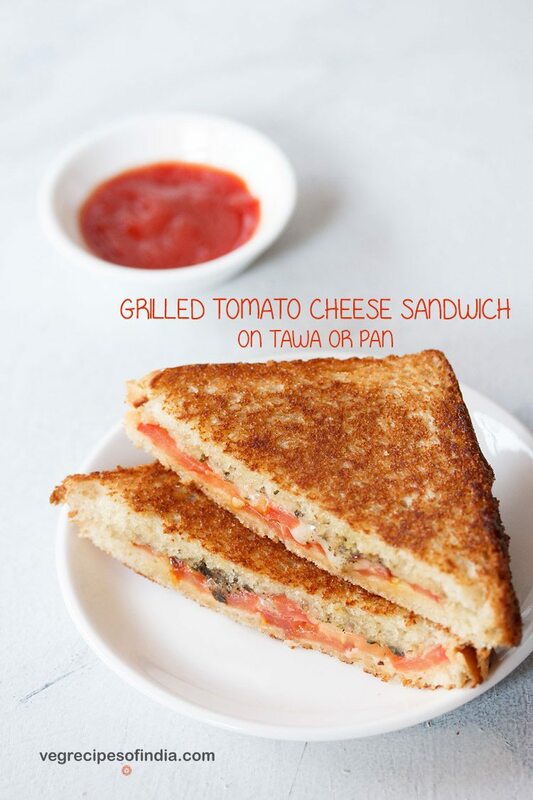 this is a quick, easy and tasty snack recipe of spiced crumbled paneer stuffed in bread slices and then baked. 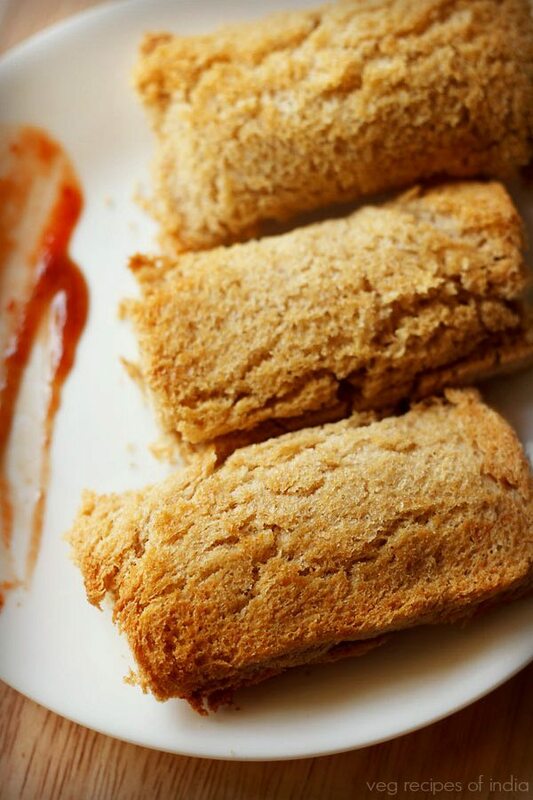 bread roll and bread pakora are of one of those snacks i make at times, when there is leftover bread in the fridge. most of the times i make potato-cheese stuffing. 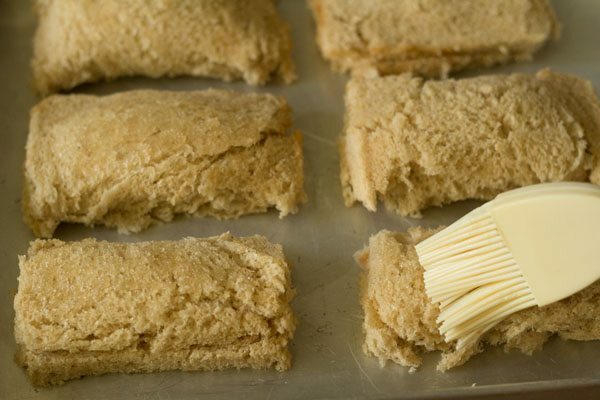 i have already shared this recipe of baked bread cheese roll. 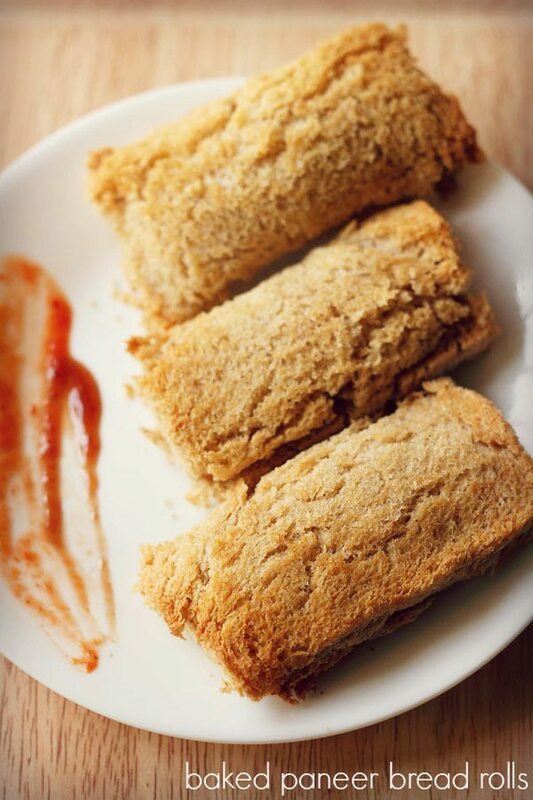 in case you are interested in the fried version, then you can check this recipe of fried bread roll. when some leftover paneer is there, i make these paneer rolls. 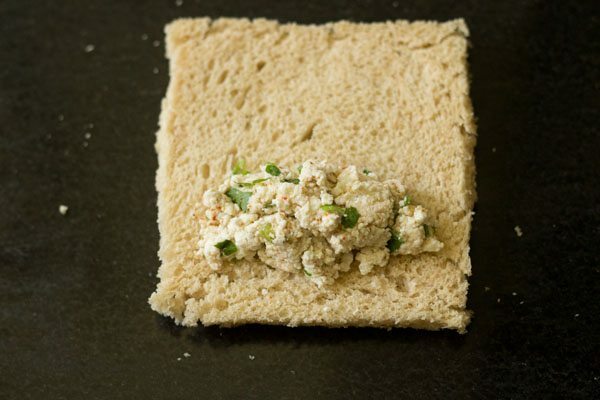 instead of paneer, you can use tofu too. 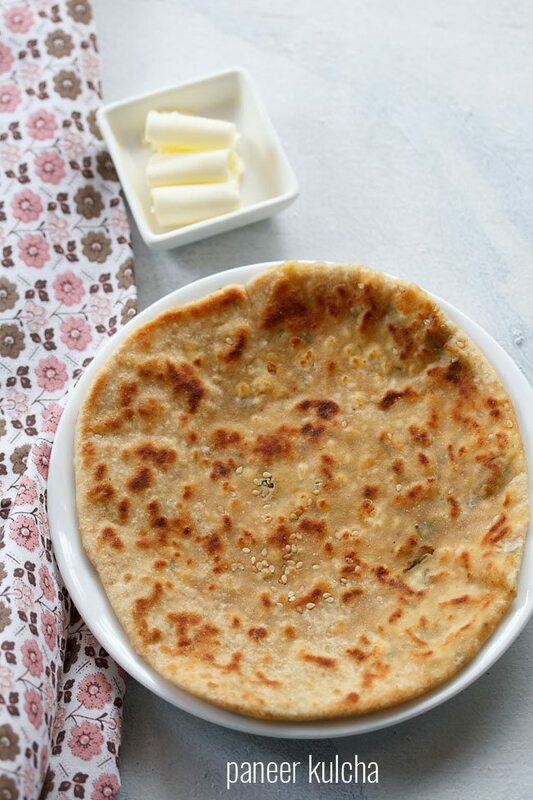 these bread paneer roll are quick enough to be made. the recipe is a no onion no garlic recipe. i usually bake these in an oven, but you can toast the bread on a tava/griddle too. 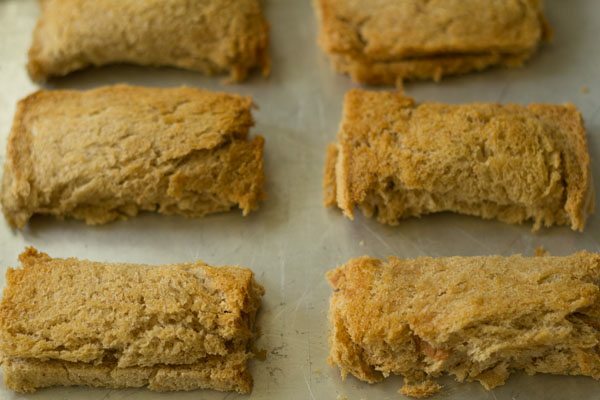 i always use whole wheat bread for the roll. you can make with homemade bread or bakery bought ones. serve these bread paneer roll hot with coriander chutney or mint chutney or tomato ketchup or tamarind-dates chutney. 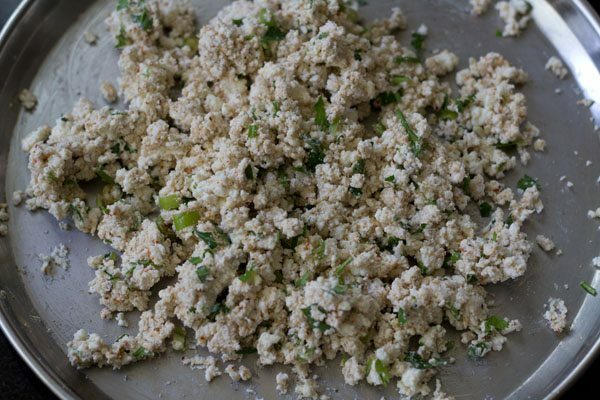 1. crumble the paneer very well and keep aside. 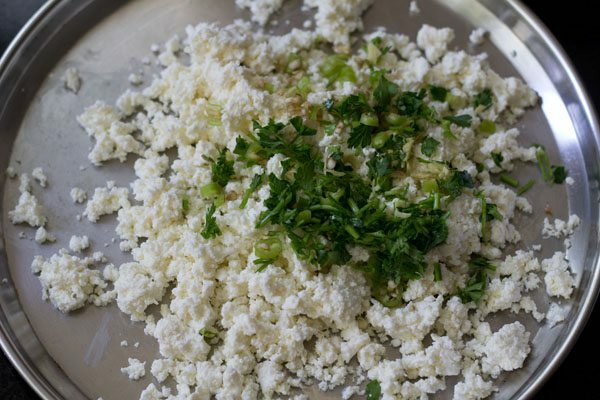 freshly homemade paneer is easier to crumble. 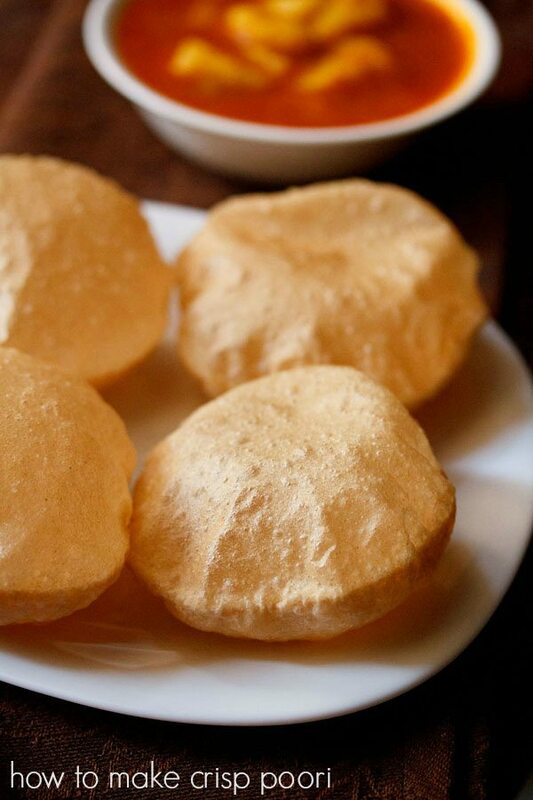 if using chilled or frozen paneer, then keep it soaking in warm water for some minutes. drain very well. 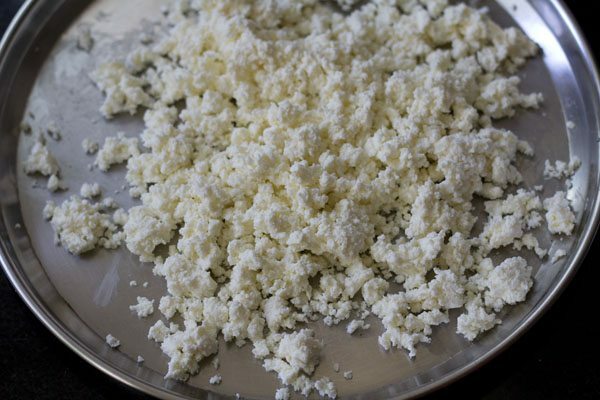 remove the excess moisture from the paneer, by patting with paper towels or kitchen napkins. crumble and keep aside. 2. add ½ tsp finely chopped or minced ginger, 1 green chili (finely chopped) and 1 tbsp chopped coriander leaves or parsley leaves. 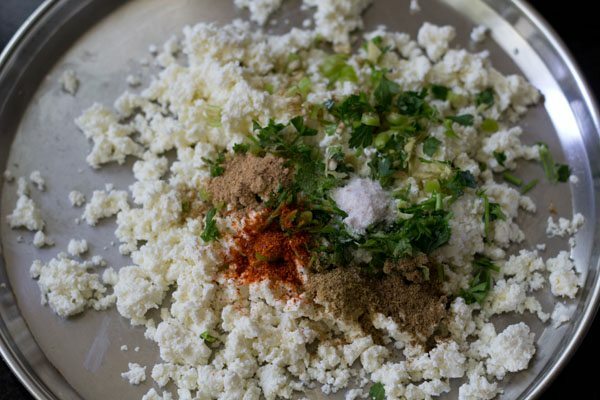 3. now add the spice powders – ¼ tsp red chili powder, ¼ tsp coriander powder, ¼ tsp garam masala powder, ½ tsp chaat masala powder and salt as per taste. 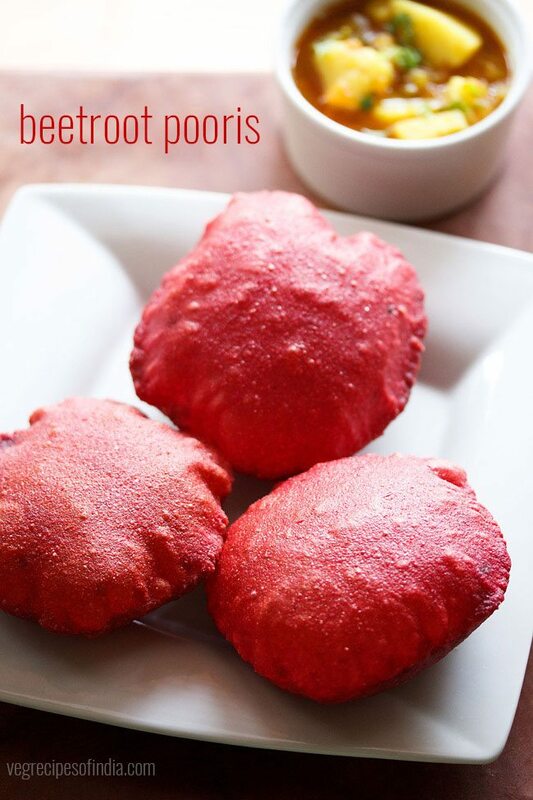 instead of chaat masala you can add ½ tsp amchur powder (dry mango powder). 4. mix very well. check the taste and add more spice powders or salt if required. 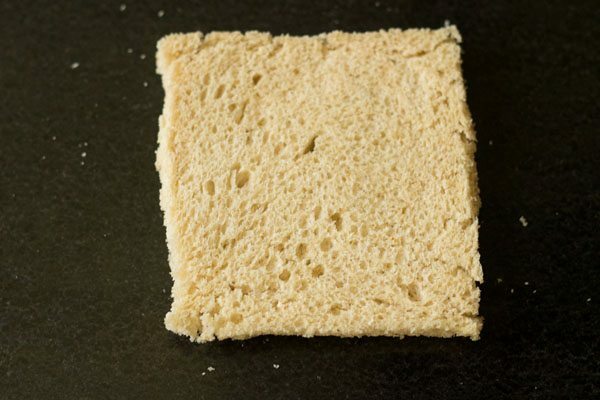 5. now take a bread slice and slice off the edges thinly. 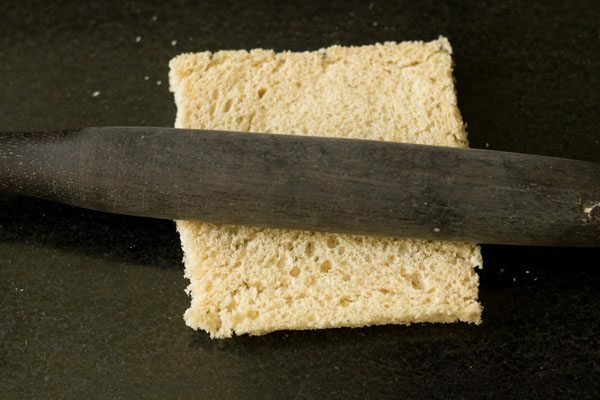 with a rolling pin slightly flatten the bread. don’t throw away these edges. pulse them in a mixer or grinder to make bread crumbs. store in a jar and keep in the fridge. use these breadcrumbs for binding or coating patties or cutlets. 6. apply a light pressure while rolling. 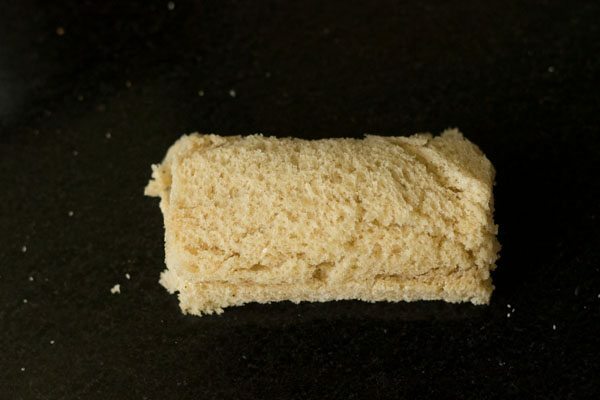 if rolled too much then the bread slice can break from the edges. 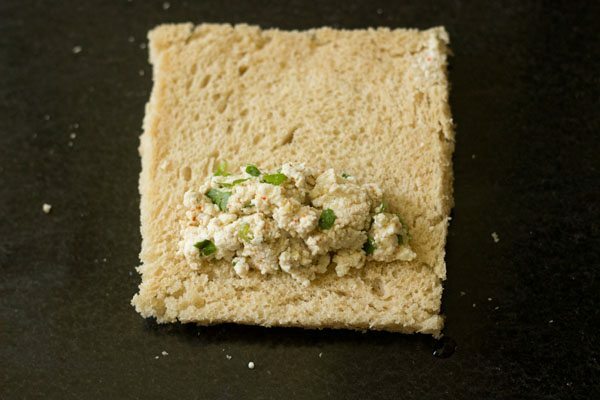 7. take 2 tbsp of the paneer stuffing and place it on one side of the bread. 8. brush some water over the four edges of the slices. you can also dip your fingertips in water and moisten the edges. press and seal the edges well. 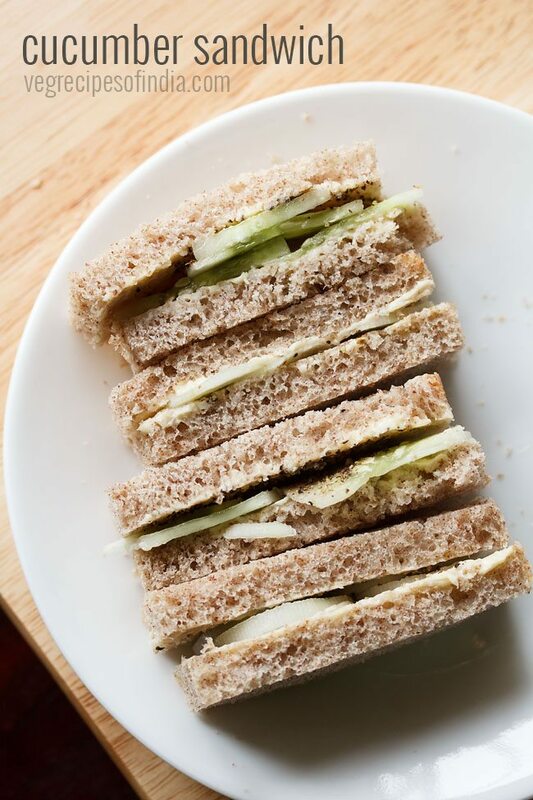 9. now gently cover the bread slice and press the edges to form a rectangular roll. you can also moisten your fingers with some water and then press. 10. prepare rolls this way and place on a baking tray. no need to grease the tray. lightly brush some oil on the rolls. don’t brush too much oil as the bread absorbs a lot of oil at room temperature. just brush lightly. the bread i used was crumbly and a three to four days old bread, so these were not easy to roll. if the rolls tear or break at some places, then no issues. 11. bake the bread roll in a preheated oven at 200 degrees celsius/390 degrees fahrenheit for 10 to 12 minutes or till the bread rolls become golden and crisp. as oven temperatures vary, do keep a check while baking. depending on the size, make, model of the oven it can take less or more time – from 12 minutes to 30 minutes. preheat the oven for 10 minutes before baking the rolls. 12. once done remove from the oven and serve these paneer bread roll hot or warm with some tomato ketchup or saunth chutney or green chutney. 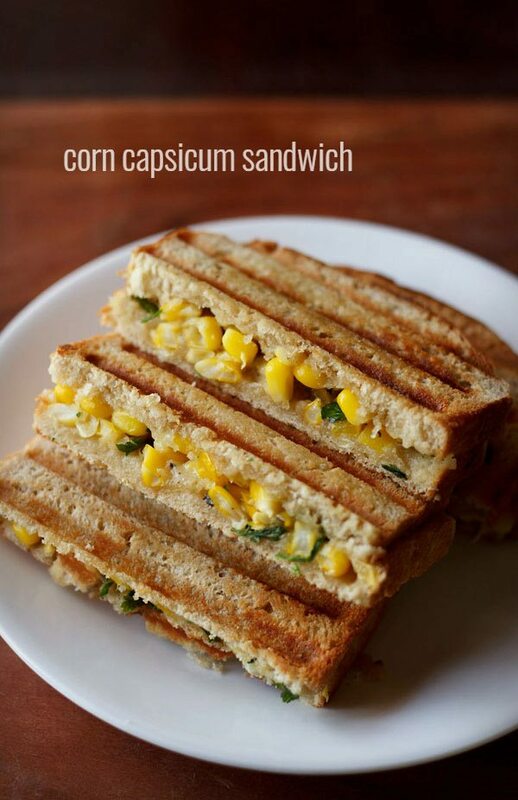 for more such recipes you can check this collection of 24 snacks recipes made with bread. I tried paneer bread roll as instruction.after preheat oven placed baking tray but all rolls burnt.what happened plz tell……..
for the rolls to be burnt, some time it will take at least. they won’t get burnt immediately as soon as you place them in the oven. did you use microwave oven or otg? if used microwave oven, did you microwave them or baked them in the convection mode? If not baking…can i fry them as well? priyanka, yes you can fry the paneer bread rolls. don’t deep fry or shallow fry. just slightly toast them on tawa with little oil. i have mentioned the method of toasting bread rolls in the recipe card.